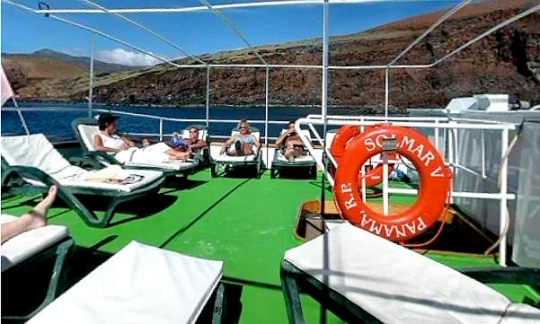 MV Solmar V is a long established Mexican liveaboard operator which runs breath-taking Pacific Ocean diving cruises to the Socorro Islands and great white shark cage diving trips to Guadalupe. 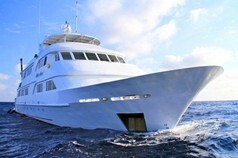 Stepping on board this 112 ft (34m) steel hulled liveaboard, you know a week of big fish action will soon unfold. MV Solmar V accommodates up to 22 guests in 12 cabins and has all the comfort and convenience you could ask for including TV and DVD player in each ensuite cabin, plus an air-conditioned dining area and saloon with communal TV and DVD player. 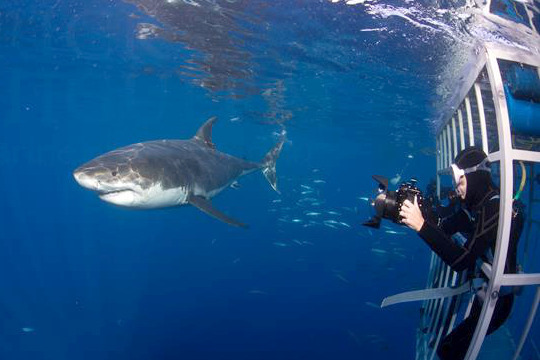 As you can imagine, the stunning underwater encounters mean that there are likely to be several photographers on board. 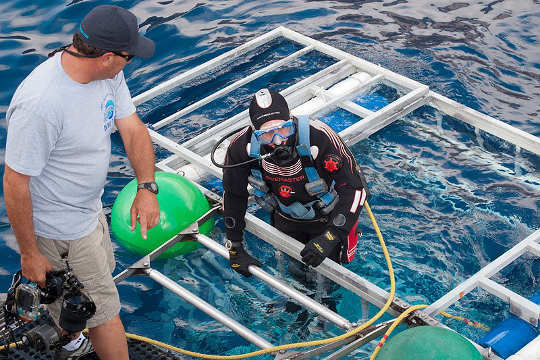 For them there are camera rinse tanks, a camera table on the spacious dive deck plus a dedicated computer room to review the day's amazing encounters. 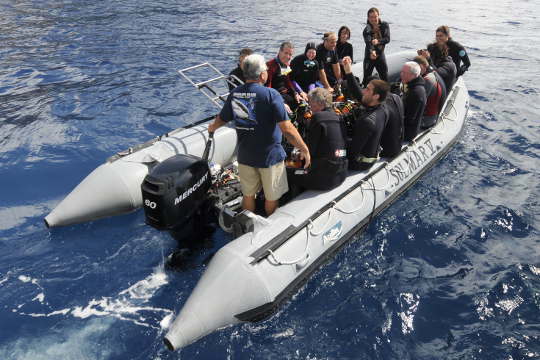 The crew are also used to helping divers with even the most unwieldy of camera equipment. There is also plenty of space outdoors to relax on the upper deck where you can laze in the sun or the shade. Guests socialize there, in the saloon, or in the camera room checking out each other's snaps. The cruise includes free beer and wine during dinner times. 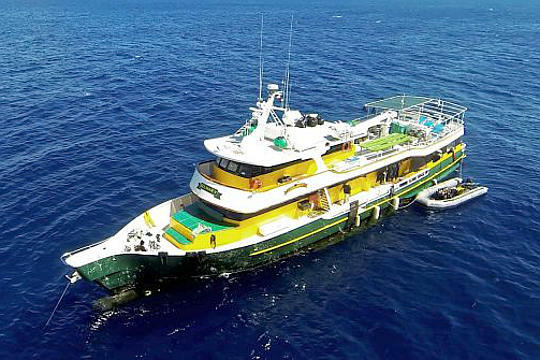 Whether you are interested in diving Mexico's legendary Socorro Islands, or cage diving with mighty great whites in Guadalupe, the Solmar V liveaboard is always a good choice. Notes: Recommended diving experience (not mandatory): Socorro Islands - Open Water Diver license and 50 logged dives. 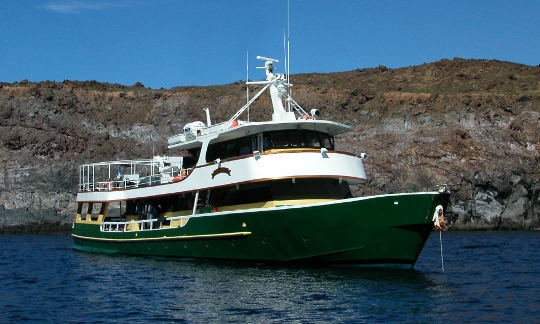 Mexico is a popular destination with limited liveaboard spaces. We recommend you book well in advance to avoid disappointment. Cruise price per person includes: Cabin accommodation, breakfast, lunch, dinner, snacks, drinking water, soft drinks, hot drinks, transfers (for Guadalupe trips) to the boat from the hotel, beer, dives (as detailed in the cruises above), experienced English-speaking divemaster(s) (11 divers to 1 guide), tanks, weights and weightbelts, national park fee and port fees. 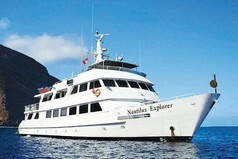 Cruise price per person excludes (mandatory, unless customer provides own): Scuba equipment (approx. US$ 240 per week), diving computer, dive insurance, recompression chamber fee (US$ 15) and 16% Mexican tax on cruise price, to be paid in advance. Unless otherwise stated, all the listed items need to be paid on arrival (cash only). Optional extras: Transfers (for Socorro cruises) to the boat from the airport/hotel, alcoholic drinks (spirits), nitrox fill for enriched air divers, torches. Unless otherwise stated, all the listed items need to be paid on arrival. 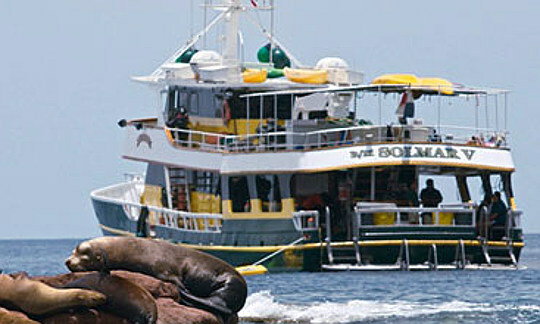 How to get there: Socorro: The MV Solmar V departs in the afternoon from Cabo San Lucas for diving safaris to the Socorro islands. Guests fly into Los Cabos international airport approximately 45 minutes drive from Cabo San Lucas. You should plan to arrive the day before departure or no later than 13:00 hrs on the day of departure. The boat will spend the last night of the trip in the harbor and so may depart at any time on the last day. 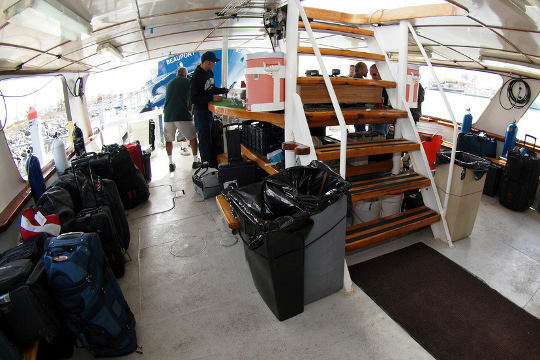 Guadalupe: For liveaboard trips to Guadalupe, MV Solmar V departs from Ensenada, Mexico. Most guests arrive in San Diego, California the night before departure and stay at the recommended hotel. 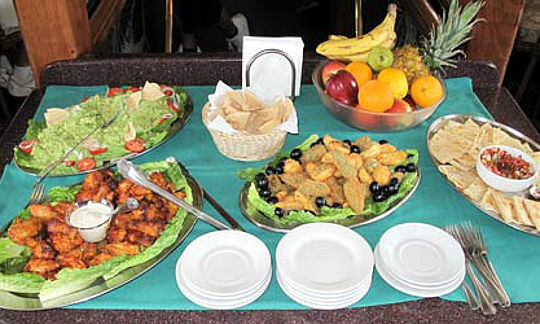 On the day of departure a luxury coach will pick guests up from the recommended hotel and transport you to Ensenada. The boat returns to port at 10:00 hrs and the coach will arrive in San Diego between 16:00 - 18:00 hrs. It is recommended that flights are scheduled for after 20:00 hrs on that day. For more information see our Mexico tourist information section. Non-diver rate: US$ 150 off the published price. Single supplement (if you do not want to share accommodation): Please contact us if you do not wish to share a cabin. Dive clubs and group discounts: Pay for 10 divers and 1 extra person can join the cruise in a Standard cabin free of charge (total 11 guests or more). See whole boat charter prices below, equivalent to: Pay for 20 guests and 2 additional persons can join the cruise in a Standard cabin free of charge (total 22 guests). Whole boat charter rate (per night): Socorro 2018 - US$ 10,611. Prices assume 20 paying guests. 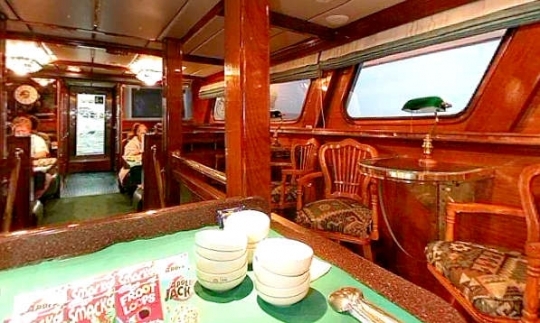 Solmar V has 12 cabins located on the lower deck. 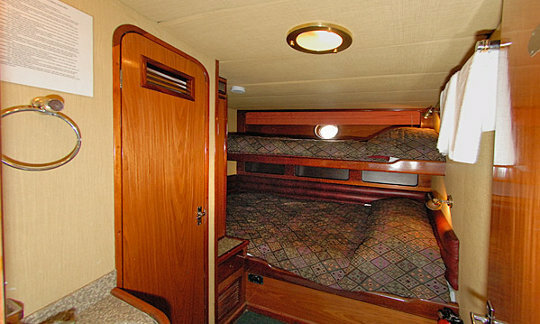 There are 6 Superior double/twin bed cabins and 4 Standard double/twin bed cabins and 2 single bed cabins. 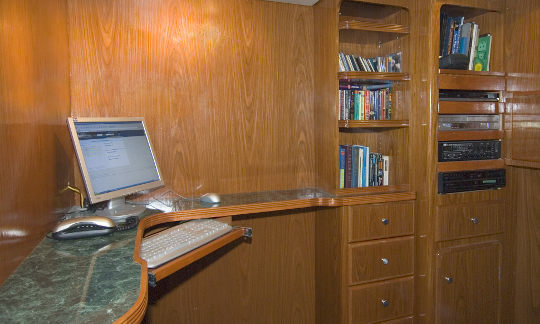 The Superior cabins are slightly larger. Each cabin has top-of-the-line 'Pillow-Top' mattresses and non-allergenic down alternative pillows and comforters. 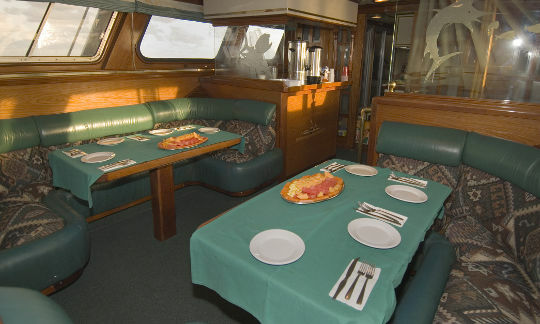 Dining on the Solmar V liveaboard, you can expect a range of international and Mexican dishes prepared using the freshest ingredients possible. Pre-breakfast before dive 1 is followed by a hit breakfast cooked to order, with a 3 course lunch and dinner served buffet-style. Beer and wine during meal times are free of charge. Air-conditioned dining area with waiter service meals. Snacks include ice cream, cookies, fruit, bread and toast. Coffee, tea, drinking water, soft drinks, beer and wine during dinner, are all provided free of charge. Spirits are available for purchase on board. Cruise dining service begins with dinner at boarding.